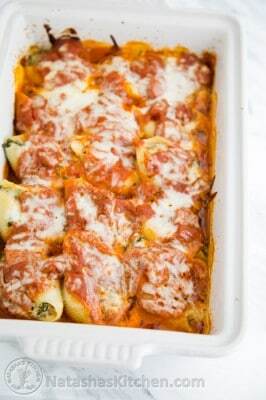 These beef and ricotta stuffed pasta shells were inspired by my favorite lasagna recipe. This is quicker and easier than making lasagna but it's still just as satisfying! This recipe makes 24 stuffed shells. Shells will fit in a 9x13 pan (6 rows long by 4 rows across) or you can split them up into smaller baking dishes if you want to freeze half for later or deliver some to family or friends. 2/3 of a 12 oz box jumbo pasta shells you need 24 shells plus a couple extra in case any break while boiling. How to Make Stuffed Shells: Preheat oven to 375˚F. Cook pasta shells al dente (firm tender) according to package instructions then drain and re-fill the pot with cold water; set aside. Keeping them in cold water will stop the cooking process and prevent the shells from sticking to each other. In a large skillet over medium heat, add 2 Tbsp oil and saute 1/2 cup finely chopped onion with pressed garlic until softened (5 minutes). Add 1 lb lean ground beef and saute breaking up the meat, until meat is fully cooked and browned. Season with 1/2 tsp salt and 1/8 tsp pepper, or to taste. Stir in 1/4 cup red wine (if using) and simmer until wine is almost completely reduced down (3 min). Stir in 1/2 cup marinara sauce and chopped spinach and cook until spinach is wilted (3 min) then remove pan from heat to cool slightly. In a large mixing bowl, stir together 16 oz ricotta cheese with 1 cup shredded mozzarella cheese, 2 large eggs and 2 Tbsp fresh chopped parsley. Stir in the meat mixture. Pour 1/2 cup marinara into a 9x13 baking dish and spread over the bottom. Drain shells and fill each one with an ice cream scoop of filling (2 rounded Tbsp); they should actually look "stuffed." Arrange pasta shells cozily into your prepared baking dish and pour remaining marinara evenly over the tops of the stuffed shells (no need for perfection). Sprinkle the top with remaining 1 cup mozzarella cheese, cover with foil (or lid) and bake until hot and bubbly (40 minutes). Remove foil and bake additional 3-5 minutes or until cheese is golden. You can eat these right away or re-heat them later :).